Essentially a larger, stronger version of the Standard Schnauzer, Giant Schnauzers have large, square-built frames covered in dense, wiry coats. Their long heads have distinctive bushy moustaches, beards and eyebrows, not to mention deeply set eyes, powerful muzzles and V-shaped ears that point up and forward. Their tails, sometimes docked, are carried high. They come in solid black and salt & pepper. 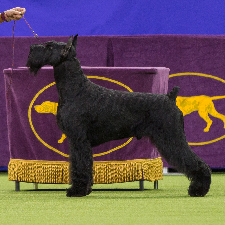 Overall, Giant Schnauzers have a sturdy, commanding and lively look. 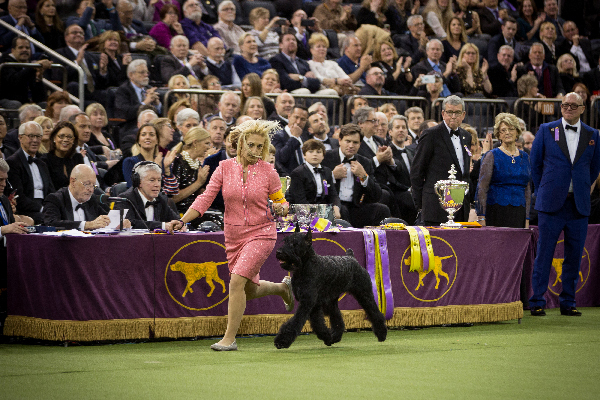 Ty the Giant Schnauzer at the 2018 Westminster Kennel Club Dog Show. Photography by Kayla Bertagnolli. Take what you know about the Standard Schnauzer—its devotion, high-energy and protectiveness—and turn it up a notch. Giant Schnauzers are bigger and bolder than their smaller cousins, but just as fun and playful. However, they need lots of attention and guidance. Given plenty of playtime, constructive games, obedience exercises and positive attention, the Giant Schnauzer will be perfectly charming. Giant Schnauzers are very attentive companions. They stay very close to their owners and sometimes watch their every move. Affectionate and attached, they love to be involved every household activity. Giant Schnauzers are superb watchdogs. Their commanding presence, combined with an intense loyalty to family, makes them a formidable household guard. However, they can easily distinguish between friend and foe. Giant Schnauzers will bark when they sense a threat to the household, but won’t make random or excessive noise. Giant Schnauzers need lots of outdoor exercise. Take them for vigorous daily walks or long jogs to help them maintain physical and mental health. An bored or ignored Giant Schnauzer can become a little agitated. Clever and trainable, Giant Schnauzers nevertheless have strong hunting instincts. The sight of small creatures—whether squirrels, birds or cats—could easily get them excited. Make sure to always walk them on a leash, and maintain a firm but encouraging hand while training. A healthy Giant Schnauzer can live as long as 15 years. Common health issues include hip dysplasia, eye problems, joint problems and bone disease. Giant Schnauzers should be brushed regularly to avoid matting, and their thick coats and beards need regular maintenance from a professional. While the Miniature Schnauzer and Standard Schnauzer were bred to be ratters and watchdogs, the Giant Schnauzer was intended for bigger tasks: hauling, herding and even barroom bouncing. Bred by crossing Standard Schnauzers with much bigger dogs (e.g. Great Danes), Giant Schnauzers managed to excel in a wide range of tasks, including cattle driving, police work and of course household companionship.